Excellent recap. You know what you’re talking about & touched on nearly every design/feature debate we’ve had the past 4 months. New York-based EuroCheapo, which has been around since 2001, just relaunched its hotel search and booking site. Interaction designer Troy Seeborn and I tried out the reworked site using our usual Paris hotel search scenario. Overall, we give it a thumbs up. It’s not perfect, but it succeeds in helping value-conscious experiential travelers find nice European accommodations. The design emphasis is on reducing user search complexity. Results are sorted by default according to the “CheapoFactor,” a customer value function of price, expert editor judgment, user ratings and distance. This one-size-fits-all function will not necessarily surface the best match for a given user. However, users will find it easy to manipulate “filters” and sort order to surface the results that are most pertinent to them. Hotel results include a prominent qualitative description based on reviews, such as “Good” or “Ok,” similar to Booking.com. This rating is comprised of the average of ratings from the various review sources EuroCheapo draws on. The site doesn’t actually explain this or indicate how many reviews influence the average. It appears that each review source is weighted equally. Our full list of Pros and Cons follows. Good ease of use. The site abstracts away much complexity. Clean visual design that eschews gimmicks and just gets the job done. The design and branding present a clear vision of the site and intended audience—it’s an easy-to-use site targeted at value conscious travelers interested in European destinations. Meta search over several booking sites including Booking.com, Venere, LateRooms, HostelBookers and HostelWorld. Integration of multiple review sources. Users can get review volume and reach from TripAdvisor reviews and balance them with trustworthy professional reviews and verified reviews from people who actually completed bookings. The application is perceptibly slow to update results when filter settings are changed. The map is by default in compact view. For viewing Paris and London, I preferred the expanded view, but every time I changed a filter setting, the view updated and the map returned to compact view. The map view setting should be sticky across user interactions. The “Filter by landmark” control is useful but what it does is somewhat opaque. 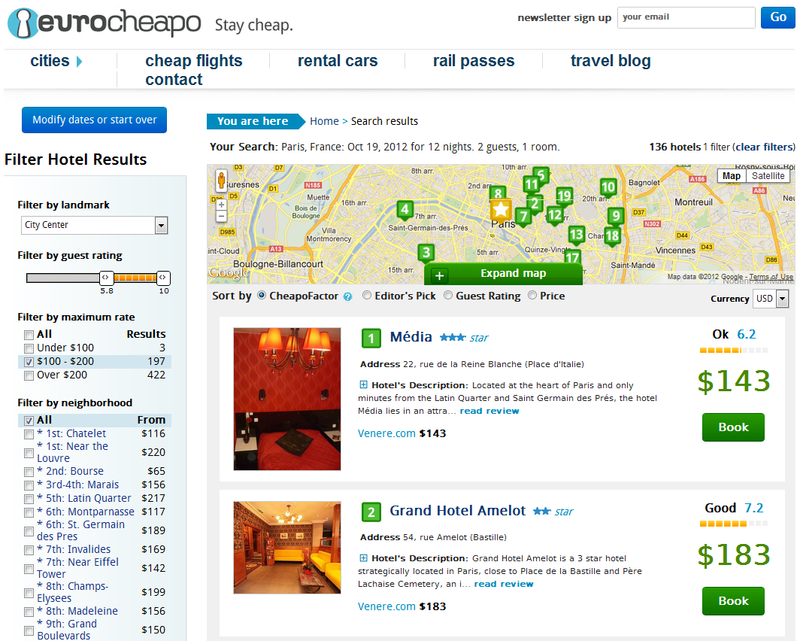 A note at the bottom of the page explains that hotel results are sorted by “CheapoFactor,” a combination of price, editor’s picks, user ratings, and distance from city center. We discovered that “Filter by landmark” changes the distance component of the CheapoFactor to be from the selected landmark rather than the city center; thus the explanatory note becomes incorrect. Furthermore, the use of the word filter for this control is not correct. A filter would reduce the size of the result set. This merely changes the sort order. “Filter by neighborhood” puts a greater cognitive burden on the user than other inputs. To someone unfamiliar with a major city, the neighborhood names lack geographical context and are not especially useful. The application could ease the burden by providing the option to display a map of the neighborhoods with local points of interest. It does provide useful hover-over descriptions for each neighborhood name. The Destination field has an “autocomplete” function that displays a list of possible city names if you pause after typing the first few letters of a city name. Unfortunately, many of the suggested cities lack any accommodations, leading to the frequent appearance of this message: “Sorry! We haven’t found any results for that search…” The developers should consider pre-filtering the autocomplete list to exclude cities which lack bookable accommodations. We found a lot to like about the site as well as a few shortcomings. We liked the simple clean visual design of the site and the easy-to-read search results list. If you are a value-conscious traveler looking to travel to Europe, EuroCheapo is worth visiting.